Whether you get your dietary protein from milk or eggs, consuming protein from these foods is an efficient way to meet your dietary protein -- and amino acid -- needs. The protein in milk varies slightly from protein found in eggs, but advantages and disadvantages exist for each. Because protein is present in a variety of different foods, you don't have to eat milk or eggs to meet your daily protein requirements -- but the high quality of proteins in these foods is often beneficial. Milk and egg proteins are both high-quality, complete proteins. This means each of these foods contains all of the amino acids you require daily to build and repair proteins within your body. 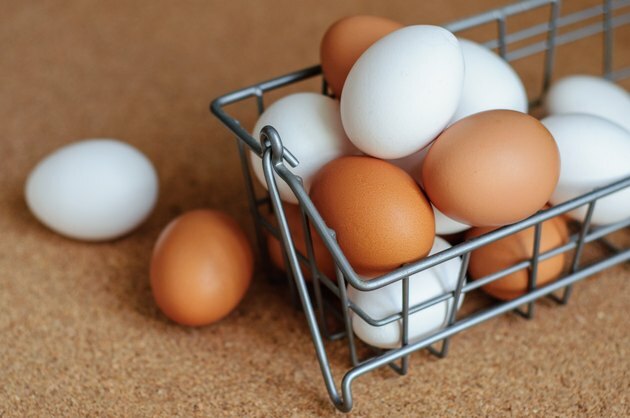 According to a review published in 2004 in the "Journal of Sports Science and Medicine," egg protein has a high biological value -- which measures how efficiently your body utilizes protein and how many essential amino acids it contains -- of 100, while milk protein's biological value is 91. But whey protein, which is one protein found in milk, has a high biological value of 104. Eggs and milk also contain similar quantities of protein, but eggs provide slightly more. A serving of two large eggs provides almost 13 grams of dietary protein, and 1 cup of low-fat milk contains about 8 grams of protein. A portion of four egg whites provides about 14 grams of protein. The Institute of Medicine suggests men get 56 grams of protein, women eat 46 grams and pregnant and nursing women consume at least 71 grams of protein every day. Though several benefits exist from getting protein from milk and eggs, there are potential drawbacks as well. Eggs are high in dietary cholesterol, which increases your risk for high blood cholesterol and heart disease when consumed in excess. The University of Maryland Medical Center suggests eating no more than four eggs per week. Higher-fat varieties of milk, such as whole milk, are high in saturated fat -- which also increases your risk for heart disease when eaten in excess. To keep your heart disease risks low, choose egg whites only and low-fat milk. In addition to the milk and egg protein in food, some dietary supplements contain milk proteins -- casein and whey -- egg proteins or a mixture of all of these high-quality proteins. Through often expensive, protein supplements can provide a much more concentrated source of dietary protein, which is beneficial for athletes who have increased protein needs. While the quality of whey, casein and egg proteins are similar, casein has the lowest biological value of 77. Casein protein is often labeled a "slow" protein because it takes longer to digest, leading to a slower release of amino acids over a longer period of time, according to a study published in 2013 in the "Journal of Sports Science and Medicine." Journal of Sports Science and Medicine: Protein -- Which Is Best? Are Eggs Good for Bodybuilding? How Much Protein Does One Egg Yolk Contain?